Grass clippings are one of the best and most commonly used mulches. When they decompose, they leave nitrogen in the soil. Clippings must be left to dry for a day or two by spreading them in the sun before they are used. If they are fresh and moist they will mat and rot, becoming slimy and foul smelling. Newspaper is great when used under other mulches. Never use newspaper by itself because it acts as a wick and pulls moisture from the soil. I place four sheets of newspaper (black print only; colored print has toxins in it) on the area I want to mulch. I then spread the grass clippings or straw on top, covering the paper completely. When paper is used, only two or three inches of an other material are placed on top. Huge quantities of mulching material are not needed. Newspaper, used with a mulch, is also good because the paper will block weeds from coming up through the mulch. Any seeds in the mulch material will not go down into the soil to sprout. Straw is a good mulch, but weed seeds may come with it. This is why paper under the straw will save a lot of headaches. Avoid hay as mulch — usually it brings weed problems. Sawdust is an excellent mulch, but must be partially decomposed before applying. Otherwise it will deplete the soil of nutrients as it breaks down. If fresh sawdust is used, apply extra nitrogen to the soil under the sawdust. I use newspaper instead of nitrogen under the fresh sawdust. Black plastic does not build the soil or contribute nutrients, but it does deter weeds and conserves moisture. Rain does not penetrate this material, so drip irrigation must be placed under it. A problem with black plastic is that it tends to absorb the heat of the sun and raise the soil temperature – sometimes very high. A layer of straw or grass clippings on top of the plastic will help. Insect Barrier – Some insects, including the Colorado potato beetle, striped cucumber beetle and spotted cucumber beetle, will avoid a mulch of straw. Water Conservation – Many times conserving water will be as important as watering the crops. During July or August dry spells, make sure the garden loses as little water as possible. Mulching helps protect bare soil from evaporation. Erosion – A layer of mulch will protect your soil from rain that causes erosion. Weeding – Mulching prevents weeds from growing. Weeds need light to grow and mulch shades out the light. Mulching too early in the spring keeps the soil from warming up and encourages rot during excessively wet periods. Wait until the soil has warmed up in the late Spring, then put mulch on the spring crops. This will help to delay bolting. Mulch the summer crops late in June when the soil has warmed and will continue to remain warm. This prevents the soil from becoming hot and dry. 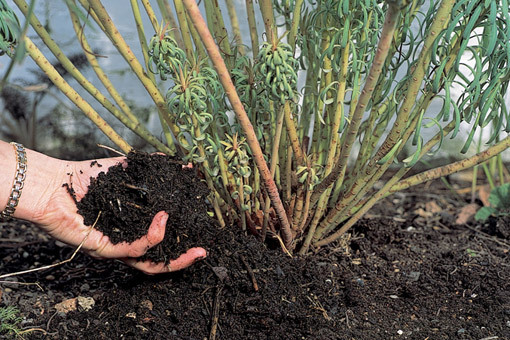 Mulching will keep the soil at an even temperature around the plant roots. Leave a gap between mulch and plant stems for air circulation. The best time to mulch is right after a rain.